But at least, you tell yourself... At least nothingll ever surprise me again. This volume, which really could have had an additional sub-sub-title of Bloody Glad Im Not, collects all the freely available webcomic material to date that the duo have been pumping out weekly on Avatars website à la FREAKANGELS. Now, I was a massive fan of volume one of CROSSED as penned by Garth Ennis and pencilled by Jason Burrows. Utterly vile wrongness, yes, but hilarious utterly vile wrongness, and thus just staying within the tightly stretched bounds of acceptability, if not good taste. Volumes 2 and 3 penned by David Lapham, minus the humour, well, I really didnt care for them at all. Happily, though, the current ongoing series, penned in turn by Ennis, Jamie Delano and currently Lapham (who has clearly been told to wind it in, at least a little bit, I suspect) is getting the franchise firmly back on track. This material, Im delighted to say, is very much in the slashed vein of Ennis, and Barreno has certainly gone for a style akin to Burrows, who is probably my favourite maniac illustrator. No one does grinning insanity quite like him, I must say, though Barreno is right up there too! This material succeeds certainly because it has humour, but also because of the taut, claustrophobic episodic feel. 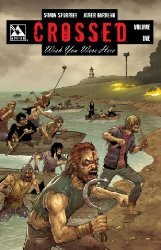 Whereas characters in the CROSSED world have always been completely disposable  and rest assured the whole cast most certainly does not make it through volume one of WISH YOU WERE HERE intact  Spurrier has created a very credible rag tag bunch of survivors who have managed to make it to the relative safety of the Shetlands. It says much for the use of the word relative, that whilst in my fanboy head I would like to think Id stand half a chance of surviving in the world of the WALKING DEAD, there is absolutely no way I would even want to think about being stuck in the living hell on Earth that is the world of the CROSSED. No sir. You dont need to have read any of the other CROSSED material to <ahem> enjoy this, in fact it would be a perfect jumping in-point to the boiling cauldron of insanity. The first page is probably the most shocking, so if the sight of man making somewhat unorthodox use of a dolphins blowhole doesnt disturb you too much, youll probably make it through with your faculties intact.